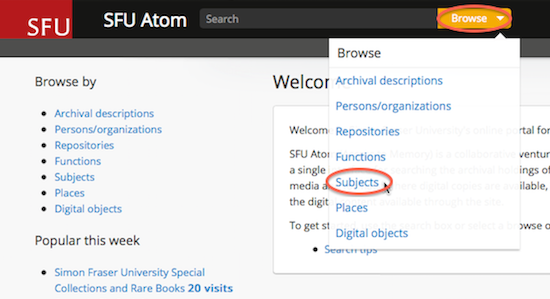 This page provides an overview for searching in SFU Atom. For general information on how archival finding aids are structured, see Users' guide to finding aids. This is the easiest way to search for keywords or phrases. The Search box is located at the top of every page in the header bar. Suggestions for matching terms will appear as you type. The results are broken down into two listings. The first is a list of descriptions of records in our holdings (e.g. files, series, fonds, collections). The second is a list of persons and organizations that created records or are the subjects of records. Note: Unlike a Google search, keyword searching in SFU Atom is not very flexible. For example, a basic keyword search on student will only return results with student and not students. If you are having difficulty retrieving relevant hits, try several variations on a word or phrase. You can also try using Boolean search operators to broaden or narrow your search. See Formatting searches below for details. 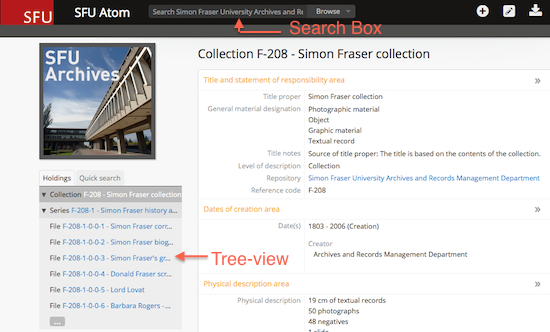 Note: The Basic search box in the header bar is set to "Global search" by default (searches the holdings of both SFU Archives and Records Management Department and SFU Special Collections and Rare Books). However, once a completed search displays a description associated with one of the two SFU repositories the global default switches to that repository's contents. 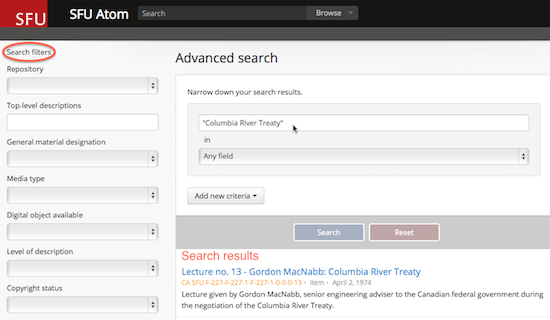 Users need to reset to "Global search" if they want to continue to search across all of SFU's archival holdings. This can be reached from any page. Click inside the Search box and then click the Advanced search link (see figure below). Use this screen to build complex searches or to narrow your searches. To narrow your search, use the drop-down menu beneath the Advanced search box (see figure below). Archival history: The succession of offices, families, or persons who held the records from the moment they were created. Also referred to as "custodial history". Scope and content: Summarizes the characteristics of the described records, the functions and activities that produced them, and the types of information contained therein. Extent and medium: The extent of the unit being described as well as other physical details or dimensions (e.g. 2 film reels, 1000 photographs, 8 m of textual records). Subject access points: Derived from the content of the records. Different SFU repositories may use different subject taxonomies. SFU Archives and Records Management Department selects all access points from the top-level terms in the British Columbia Thesaurus and applies them at the fonds and collection level only. 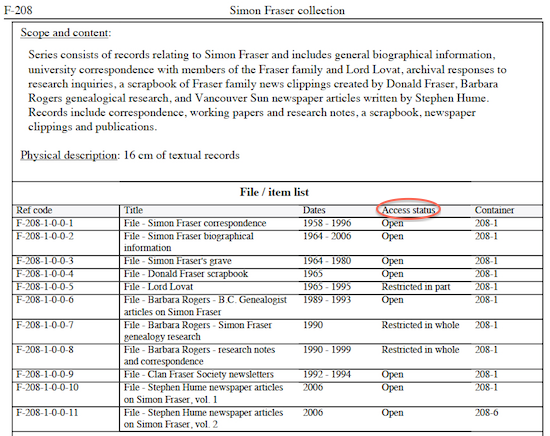 SFU Special Collections and Rare Books is currently examining different subject-based taxonomies for use in SFU Atom. Name access points: Names of persons and organizations related to the records (e.g. persons who are subjects of the records, persons creating the records, persons receiving the records, organizations creating the records, etc.). Place access points: Geographical areas to which the records relate. Identifier: A unique combination of letters and numbers used to identify an archival unit of description (e.g. fonds, series, sub-series, file, item) to facilitate i18n.en.storage and retrieval. See Users' guide to finding aids for a description of the numbering system employed by SFU Archives. Use the Add new criteria button to build multi-part queries with Boolean search operators. You can narrow your search, combine terms, or exclude terms. Use AND to combine search terms to narrow your search (e.g. search student AND protest to return only descriptions that contain both search terms). Use OR to combine search terms to broaden your search (e.g. search student OR protest to return descriptions that contain either search term). Use NOT to exclude terms (e.g. search student and NOT protest to return descriptions that include student but do not contain the term protest). Repository: You can limit your search to the archival holdings of SFU Archives and Records Management Department or SFU Special Collections and Rare Books. Top-level descriptions: You can limit your search to a certain fonds-level or collection-level description. Place your cursor inside this field to see an alphabetical listing of all the fonds and collections held at SFU or enter the exact name of the fonds or collection to locate it in the list (note: the list cannot be scrolled). General material designation: You can limit your search to the type of record material you are interested in (e.g. architectural drawing, photographic material, textual material, etc.). Media type: You can limit your search to a particular type of digital object (e.g. audio, video, image, etc.). Digital object available: You can limit your search for descriptions that are linked to digital objects only or for descriptions that are not linked to any digital objects. 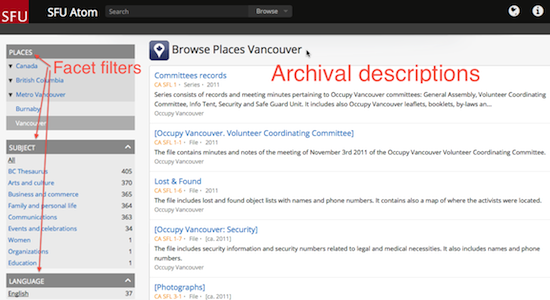 Level of description: You can limit your search to a level of archival description such as fonds, series, file or item. Copyright status: You can limit your search based on one of three basic copyright designations for digital objects -- public domain, under copyright or unknown. Consult an archivist if you wish to copy records for a purpose other than research or private study. 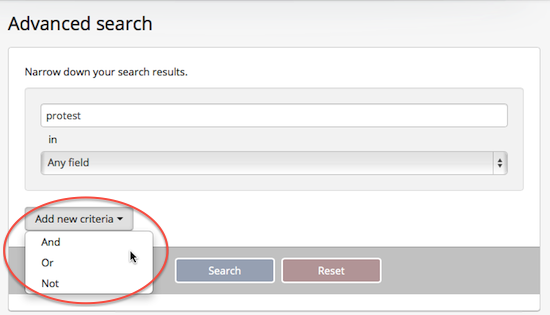 Use the Search button or the Enter button on your keyboard to start your advanced search. To find an exact phrase, use quotation marks (e.g. "Terry Fox"). AND Use to combine search terms to narrow your search (e.g. search student AND protest to return only descriptions that contain both search terms). OR Use to combine search terms to broaden your search (e.g. search student OR protest to return descriptions that contain either search term). AND NOT Use to exclude terms (e.g. search women AND NOT student to return descriptions that include student but do not contain the term protest).
" " Terms enclosed in quotes must appear exactly as provided (e.g. "student" will find student, but not students). + Term after "+" must be in the result (e.g. +student protest requires that results must contain the term student in them, and may have the term protest). - Term after "-" must not be in the result (e.g. -student protest requires that results must not contain the term student in them, and may have the term protest).
? Character wildcard (e.g. p?per will find paper and piper, but not pepper). * Multiple character wildcard (e.g. galax* will find galaxy and galaxies, but not galactic). ~ Fuzzy search. Will return results with words similar to the term (e.g. fjord~ will find Fjord, fjords, ford, form, fonds, etc.). && Can be used in place of AND. Will cause an error if combined with spelled-out operators (e.g. student && protest AND sixties will fail; student && protest && sixties will succeed).
! Can be used in place of NOT. Will cause an error if combined with spelled-out operators (i.e. use "!" or NOT but don't use these operators in combination with each other in a single search). Boolean search operators will cause your search to fail if they are used improperly. For example, do not use an exclamation mark in a search query (e.g. SFU celebrations!) since it functions as a Boolean operator that will exclude the term that follows it. These alphanumeric strings are used to denote archival units of description (e.g. files and items). They contain hyphens which can be confused as Boolean search operators and so must be enclosed in quotation marks to avoid a failed search. 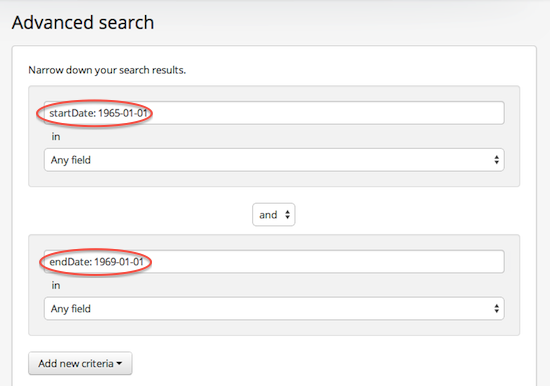 To search by date range, use the advanced search page and enter two date searches joined with "AND". Go to the Advanced search screen and select a fonds or a collection from the "Top-level description" field (see figure below). 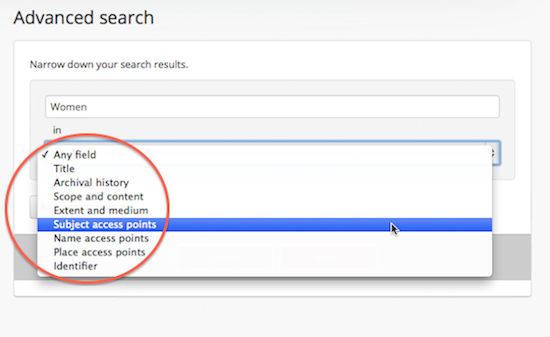 Enter a term or phrase in the Advanced search screen box and press the Search button. The resulting list of hits will be restricted to the occurrence of your search term or phrase within the description for the fonds or collection you selected. Find a fonds or a collection using either the Basic screen screen or the Advanced search screen. Click the Quick search tab located in the left-hand section of the screen just above the tree-view display (see figure below). Enter a term or phrase in the Quick search box and press the Enter button on your keyboard. You can search on specific fields by appending "i18n.en" to the field name, followed by a colon and a search term [i18n.en.fieldName: searchTerm]. Enter the query in the Search box located in the header bar. Please note that Atom's field labels do not always correspond to internal field naming conventions. Since the latter is needed to construct this type of query, refer to the concordance provided below. For ease of reference, field names have been grouped under the description areas in the order in which they appear in an Atom descriptive record. Start date = dates.startDateString: [searchText]. You can combine a start and end date search with Boolean Search Operators. End date = dates.startDateString: [searchText]. You can combine a start and end date search with Boolean Search Operators. Click the Browse button adjacent to the Basic search box in the header bar. Click Persons/organizations. Enter a term or phrase in the Search box and press the Enter button on your keyboard. The resulting list of hits will be restricted to descriptions of persons and organizations. 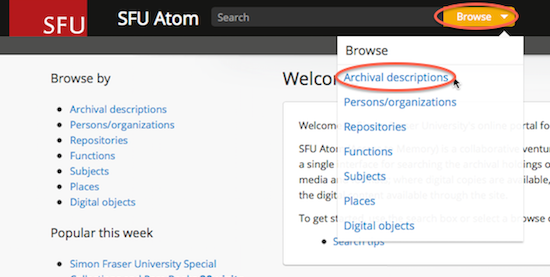 The Browse menus in SFU Atom allow you to browse complete lists of archival descriptions, as well as authority records (for persons and organizations), repositories, subjects, places and digital objects. This browse screen shows all archival descriptions regardless of the level of description (e.g. fonds, series, file, item). You can narrow the results list using the available facet filters located on the left-hand side of the screen (see figure below). At the top of the archival description browse page's list of results, the number of descriptions with digital objects is available and you can click the link to the right to narrow the results to only those descriptions with associated digital objects. Please note that as of the launch of SFU Atom in June 2014, very few digital objects have been uploaded to the database. The number of digital objects available will grow over time. In SFU Atom, persons and organizations (corporate bodies) are entities which have their own descriptive records (authority records). These entities can be selected in the Browse menu. Click the Browse menu, then click on Persons/organizations. You can narrow the results list using the available facet filters located on the left-hand side of the screen, which for authority records includes language in which the description is written and entity type (Person, Family or Corporate Body). 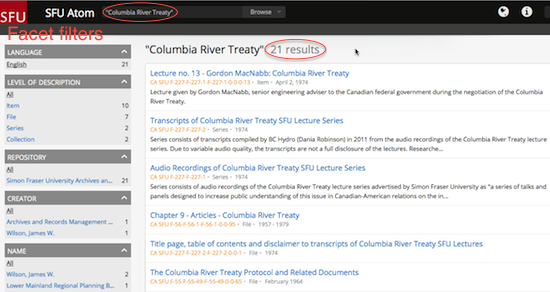 As of the launch of SFU Atom in June 2014, only English language authority records have been uploaded to the database. Multi-lingual authority records may be added over time as resources allow. 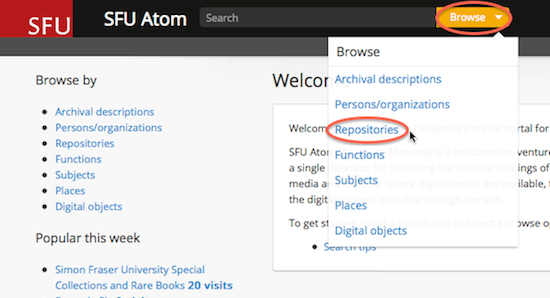 SFU Atom contains descriptions of the holdings of two repositories at Simon Fraser University -- The Archives and Records Management Department located in the Maggie Benston Student Services Building and Special Collections and Rare Books located in the W.A.C. Bennett Library. Click the Browse menu, then click Repositories. To narrow your browsing to a single repository, click its logo. You can further narrow the results by using the available facet filters located on the left-hand side of the screen. Click the Browse menu, then click Subjects. SFU Atom will display a list of all subjects used to index archival descriptions as well as the number of descriptions the subject term appears in. By clicking on a subject term, you can see in a new browse screen the archival descriptions to which that subject term has been applied. Subject terms are applied only at the fonds and collection level and not at lower levels of description (e.g. series, files, items). Different SFU repositories may use different subject taxonomies. 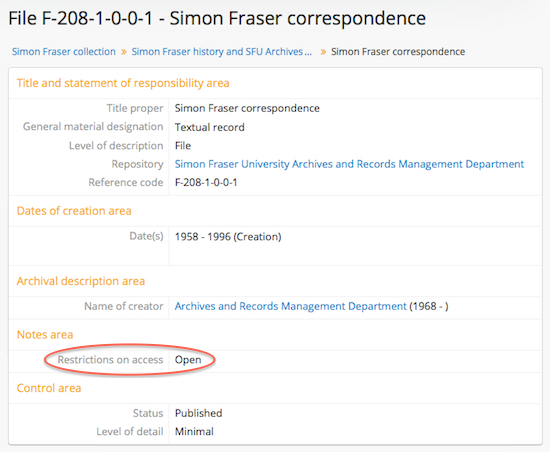 SFU Archives and Records Management Department selects all access points from the top-level terms in the British Columbia Thesaurus and applies them at the fonds and collection level only. SFU Special Collections and Rare Books is currently examining different subject-based taxonomies for use in SFU Atom. Click the Browse menu, then click Places. SFU Atom will display a list of all the geographical areas to which the records relate as well as the number of descriptions the place terms appear in. By clicking on a place term, you can see in a new browse screen the archival descriptions with that place term applied. 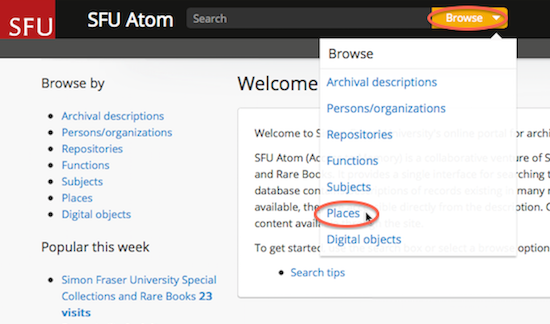 In this browse screen, SFU Atom will also display an alphabetical list of places in the left-hand side of the screen to allow for easy navigation between places. Please note that the assignment of place terms were not regularly applied to archival descriptions before the launch of this database in June 2014. As a result, this browse feature has yet to be optimized. Click the Browse menu, then click Digital objects. 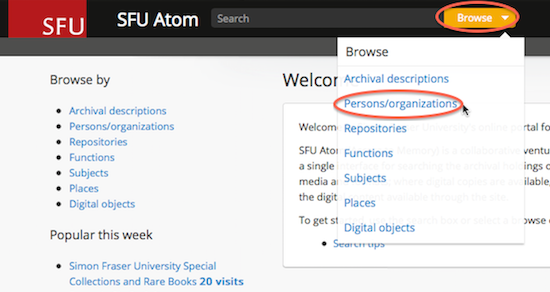 SFU Atom will display all of the digital objects in the database. 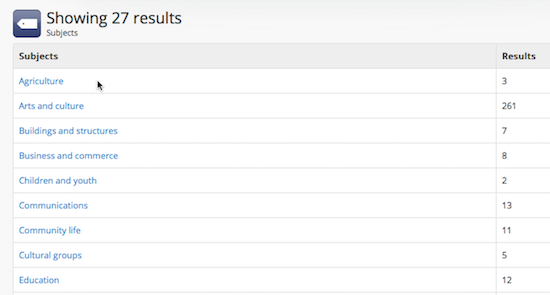 You can filter the results by media type by clicking the facet filter buttons at the top of the search results. 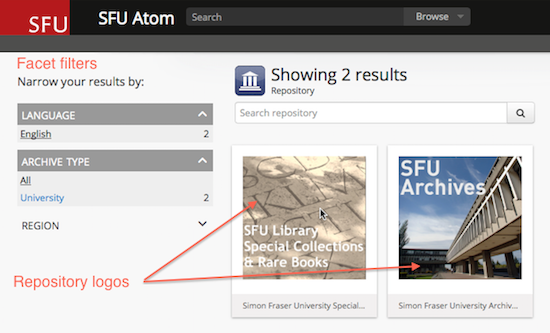 Please note that as of the launch of SFU Atom in June 2014, very few digital objects have been uploaded to the database. The number and types of digital objects available will grow over time. Displays the results of your search but without facets. Results may be narrowed by selecting filters located on the left-hand side of the screen and clicking the "Search" button again. A full description appears when a hit in the listed search results is clicked. A full search displays the archival description within the full context of a fonds or collection and gives you more detailed information. Holdings: displays the current description's place (highlighted) within the overall hierarchy of the fonds or collection and provides links to related descriptions within the same body of records. Quick search: search within the currently selected fonds or collection (title or identifier fields only). Container name: The identifier associated with the physical storage container in which the records described are housed (if analogue) or stored on (if digital). Access restrictions may apply to records described in Atom. Such restrictions are most often the result of provincial access and privacy legislation requirements. Occasionally, donors apply time-limited access restrictions to the records they deposit with us. To make the most of your time, it's best to scan the descriptions in Atom before visiting the Archives to identify file-level access restrictions. Files marked "Open" can be accessed in our Reading Room or through Atom (if they exist in digital form). Files marked "Restricted in Part" indicate that some small portion of the file's contents are restricted, but the remainder of the records are open and they can be accessed in our Reading Room or through Atom (if they exist in digital form). Files marked "Pending Review" or "Restricted in Whole" are not readily accessible. To access these files, speak with an archivist about possible next steps. You may be able to gain access to restricted records through an access review process or by applying for a research agreement. These processes can be time consuming, therefore, it is best to identify files of interest as early as possible in your research time line and contact the Archives to request advice on how best to proceed. Navigate to a fonds or a collection of interest in Atom. Click on the "Reports" link located in the top left-hand corner of the screen. Select "File list" as the report-type, followed by "Reference code" as the sort-type and then click continue. 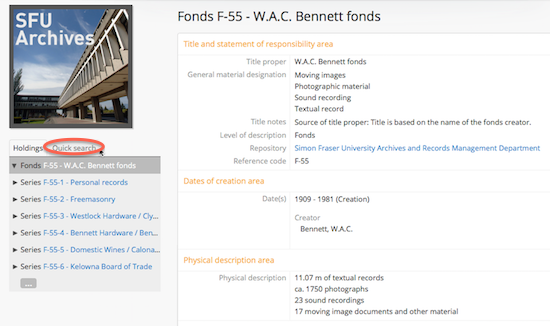 This will generate a complete file listing for the fonds or the collection in printable form. Look for the "Access Restrictions" column. If you want to narrow the scope of the file listing to a particular series, sub-series, or sub-sub-series, simply navigate to that descriptive level and repeat the same steps. Navigate to a fonds or collection of interest in Atom. Click on the "Download" link under the "Finding aid" heading located in the top left-hand corner of the screen. If the link reads "Status: Unknown", contact an archivist. A finding aid can be generated quickly and posted online. Navigate to the descriptive record for the file of interest. Locate the "Notes Area" section of the description, followed by the "Restrictions on access" field. The latter will describe the access status of the file. Click here to view more detailed user documentation prepared by Artefactual Systems Inc., the developer of the Atom open-source archival description software. Click here to link to MemoryBC, a portal where you can access descriptions of archival materials preserved in repositories throughout British Columbia. Click here to link to Archives Canada, a portal where you can access descriptions of archival materials preserved in repositories throughout Canada.